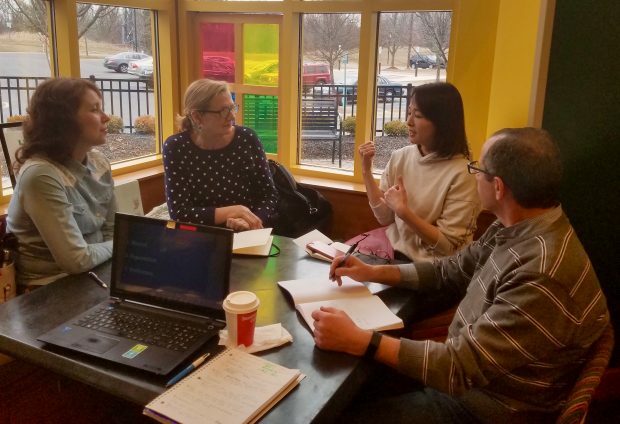 This spring, seven conversation groups for our English language learners are underway throughout Oakland County. Currently, groups meet in Troy, West Bloomfield, Bloomfield Hills, and Rochester Hills. Some meet during the day; some in the evening. Conversation groups are organized with students whose listening and speaking ability is about the same level. This approach differs from other conversation groups in the area that are open to everyone. Our approach ensures all students can participate equally. Conversation groups give English language learners extra practice listening and speaking a new language. Samantha Most is facilitating her second, six-week conversation group at the West Bloomfield Township Public Library on Thursday evenings. The group attracts English language learners from Poland, Ukraine, China, Japan, South Korea, and Syria. “I’ve noticed that the students love learning about other cultures,” says Samantha, who also tutors a student one-on-one through Oakland Literacy Council. Recently, she asked her conversation group how the arrival of spring is recognized in students’ home countries. Some countries had special celebrations. At each conversation group, Samantha also introduces a few vocabulary words, and the students practice using the words in conversation. The intention behind the conversation groups is to give students another venue for practicing their listening and speaking skills beyond their individual tutoring sessions. The more practice they get, the faster they will progress in their studies.